"I live with 200 other kids who come from different states and different countries. I'm creating friendships here that I'll still have after high school and even after college. Being able to live with my classmates and get to know them so well, supporting them, and knowing they support me, has been so special. We're all in it together. It's like having 200 siblings." CHRISTCHURCH'S BOARDING STUDENTS GAIN A SENSE OF INDEPENDENCE AND RESPONSIBILITY THAT PREPARES THEM FOR COLLEGE AND THE WORLD BEYOND. LEARNING TO GET ALONG with their roommates and peers, take care of their belongings and living spaces, make wise choices, and manage busy schedules fosters a sense of self-confidence and maturity. Christchurch residence halls are a welcoming home away from home, a place where friends live, study, and relax together. 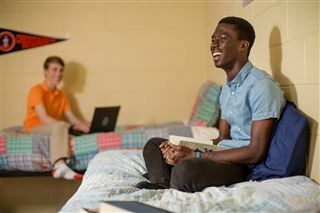 Student gain a new sense of independence living away from mom and dad, but can rest assured that dorm parents will be available 24/7 to help with everything from coping with homesickness to how to do laundry. CCS in a Minute ... What will my room look like? GIRLS from ChristchurchSchool on Vimeo.